Who will protect the children from bullying? 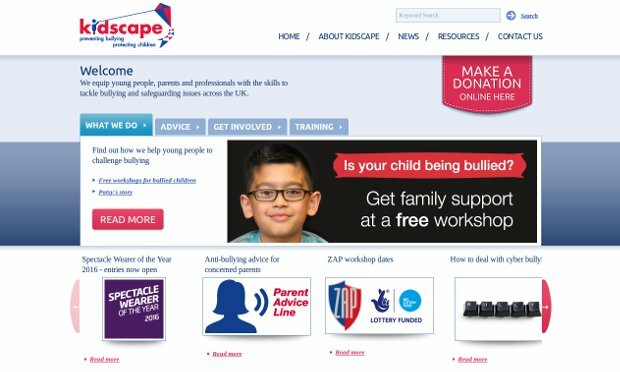 Since 1985, Kidscape works tirelessly to promote the anti-bullying message and shine a spotlight on child protection issues. They believe that all children should be able to grow up in a world free from bullying and abuse, and that all adults should keep children safe and help them to reach their full potential. Their mission is to ensure children live in a safe and nurturing environment. By providing training, support and advice to children, parents, schools and those in professional contact with young people, they enable them to gain knowledge and develop the confidence and skills to challenge abuse and bullying in all its forms. Through a training programme they are enabling teachers and support workers to identify and provide support to underachieving and vulnerable young people who are not engaging with education as a result of the bullying they are experiencing, or indeed the bullying they are perpetrating.